The Great Reading Adventure is linked to the Portrait of a Nation initiative. Portrait of a Nation is run by the Liverpool Culture Company, member cities of the Cultural Cities Network (UCN) and the Heritage Lottery Fund (HLF). It began in 2007 and will become a high profile strand of the European Capital of Culture 2008 celebrations this year. The campaign works with young people across the UK to showcase their own local, regional and national identities through a series of events in 18 cities, feeding into a pinnacle showcase that will close the Liverpool European Capital of Culture 2008 celebrations. In Bristol, a programme of free workshops is being provided to selected Bristol schools and colleges, coinciding with the Great Reading Adventure. The young participants are creating collages/banners, comic books, written work and drama pieces on the themes of identity, roots, heritage and culture, focussing in particular on the city neighbourhoods in which they are based. 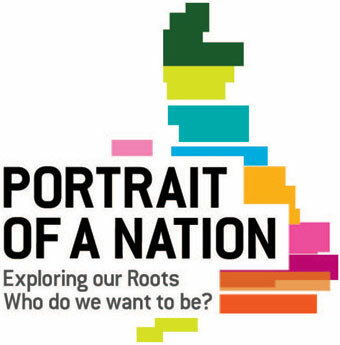 The Portrait of a Nation website will be live by the end of February and will include a showcase for the Bristol activities. For further information on the workshops, see the Education section of the Great Reading Adventure website. 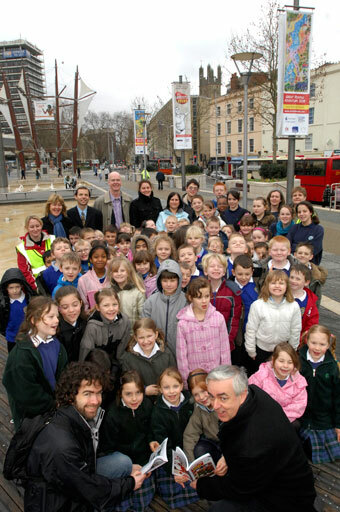 Bristol school pupils in the city centre to see their Portrait of a Nation banners on display. Adrian Tinniswood, Chair of Heritage Lottery Fund South West, is the tall gentleman standing at the rear (Martin Chainey). You can download a 4.3MB Word document in which all the material produced so far in Bristol for Portrait of Nation has been gathered here. City of Bristol collage for Portrait of a Nation (Martin Chainey). New Oak Primary collage for Portrait of a Nation (Martin Chainey). Fair Furlong Primary collage for Portrait of a Nation (Martin Chainey).